Save the Date!!! 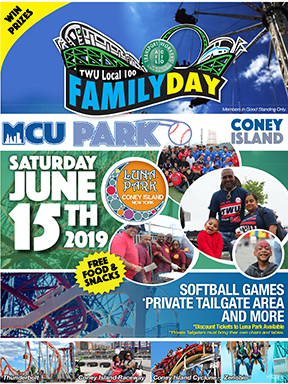 It's TWU Local 100 Family Day, our extravaganza at MCU Park in Coney Island, when thousands of transit workers and their families join together for a full day of fun, free food, free stuff, rides for the kids, and our famous Departmental tail-gates. Download the flyer here, fax back or email to let us know you're coming.